The all access pass includes free priority access to all the parties with a 50% off over the total amount of the single ticket prices. Buy your all access pass at Girliecircuit.net, Ticketmaster.es or authorised sellers. Girlie Circuit Festival venues will be accessible for wheelchair users. Clients with special needs can contact the organisation. The Girlie Circuit bus is the quickest and most convenient way to get to the parties from Barcelona’s downtown. Check routes and conditions here. For your convenience, we recommend you to bring cash to purchase your exchangeable drink tickets. Girlie Circuit Festival will offer cloakroom service in every party. In the Water Park Party we will offer up to three different cloakrooms where you can store all personal belongings with all comfort and warranties. Girlie Circuit Festival means party, but also leisure and much more. Check our daytime program where you will find many activities featuring arts, sports, cinema, culture and awareness. Girlie Circuit Festival does not allow food or drink into any of the venues. Do not forget to bring always your original ID, NIE or Passport. Illegal substances are prohibited in all our parties and events. Girlie Circuit Festival has fitted out a Welcome Point (Aribau, 31) available every day of the event from 2 pm to 10 pm. There you will be able to pick up your all access pass, buy tickets and merchandise and receive all kinds of information. Besides the Welcome Point, there will be Girlie Circuit’s information staff in all our events and parties and also in each of our buses. They will be identified with a special t-shirt and accreditation. Feel free to ask them any question. Minors under the age of 18 can’t enter into the parties. For your safety, first aid care teams will be strategically located in each Girlie Circuit party. Men are welcome, as long as their attitude is friendly. For your safety, Girlie Circuit Festival works with experienced and respectful security staff in all venues and common areas. Straight audience is totally welcome, as long as their attitude is friendly. 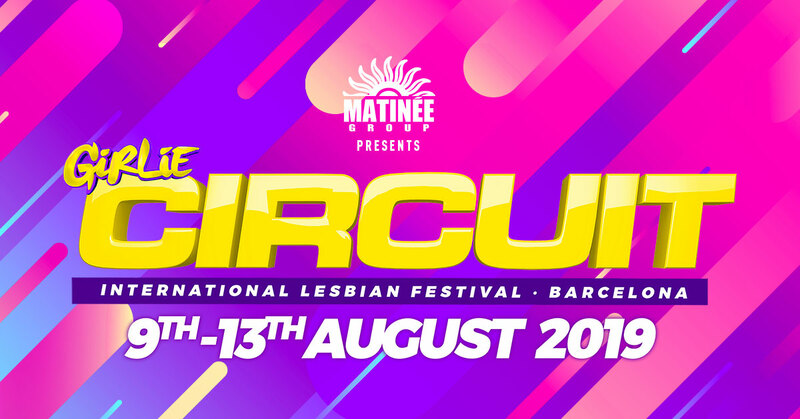 Buy your advance single tickets on Girliecircuit.net, Ticketmaster.es or authorised distributors. Also, you will be able to purchase them in Barcelona during the days of the event from 2 pm to 10 pm at the official Welcome Point or at the ticket offices. Only official tickets will grant you access to the festival, watch out for possible unauthorised ticketing companies. The promoter will not be responsible for falsifications. Transsexual public is absolutely welcome. The Girlie Circuit bus is the quickest and most convenient way to get to the parties. Also, there will be staff from the organisation on board. Check available routes here. Circuit’s Water Park Day is the biggest LGTBI water party. From 10 am to 2 pm, you will be able to enjoy the water rides and relax with soft music. Afterwards, the volume will rise and the party will start in the waves pool area. At 10 pm, water areas will be closed and the night venue will be ready to hold the Water Park Night Edition until 6 am.